The past year saw some significant developments in the world of PC music. PC Notes looks back over 2008 to assess the changes it brought and turns an eye to what we can expect to be doing in 2009. As I write this, it's the beginning of the new year and therefore an ideal time to cast our eyes back over the last 12 months. The world of PC music has changed a lot in that time, and nowhere more dramatically than in the area of processing power. In the very first PC Notes column of 2008 I updated my recommendations for DIY PC builders from an E6600 2.4GHz dual‑core processor to a Q6600 2.4GHz quad‑core version, doubling the available processing power, but by last month I was raving about Intel's new Core i7 920 2.66GHz, with a whopping eight virtual cores for very little more money. The switch by manufacturers from single‑core CPUs to two, four, and now eight virtual cores in one physical package has enabled them to accelerate available processing power in far bigger leaps than ever before, which should really please those musicians who are always hungry to run more of everything. Those who currently have to use banks of PCs to achieve the overall performance they require will be able to cut down on the number of computers in their studios, resulting in less noise and heat, while I suspect that sales of dual quad‑Xeon‑based PCs will drop in favour of similarly powerful but cheaper Core i7 systems, particularly once motherboards appear that offer bigger limits for system RAM, beyond today's 6GB typical restriction. Stop The PC, I Want To Get Off! However, as I first mentioned in PC Notes March 2008, many musicians have now climbed off the PC upgrade bandwagon because they are perfectly happy with the performance of the computers they already have. I've been monitoring this trend ever since, and more and more musicians are now admitting that they simply won't need a new PC in the foreseeable future. This is not always because of processing power, either. Years ago, every musician looked forward to eventually buying or building a new PC, because doing so invariably removed a whole set of long‑term frustrations. However, quite a few are now openly admitting that they dread getting a new PC because of the length of time it takes to reinstall their applications, plug‑ins, software instruments and sample libraries. Hard drives have grown in leaps and bounds, with the smallest SATA models (costing a minuscule £30$60) now starting at 250GB. Late last year Seagate even announced a 1.5TB (1500GB) version of their their Barracuda range. More capacious hard drives mean we need to fit fewer of them, once again resulting in both less heat and noise, and they are great for those running complex projects with loads of 24‑bit/96kHz audio tracks, and those who routinely install huge sample libraries. However, they have a knock‑on effect when you're considering an upgrade. Gone are the days when getting a new computer meant spending a weekend reinstalling your software; nowadays it can sometimes end up taking an entire week! With CPU performance seemingly doubling every year, and hard drive capacity every two years, more and more PC users will find that they can jump off the upgrade bandwagon. 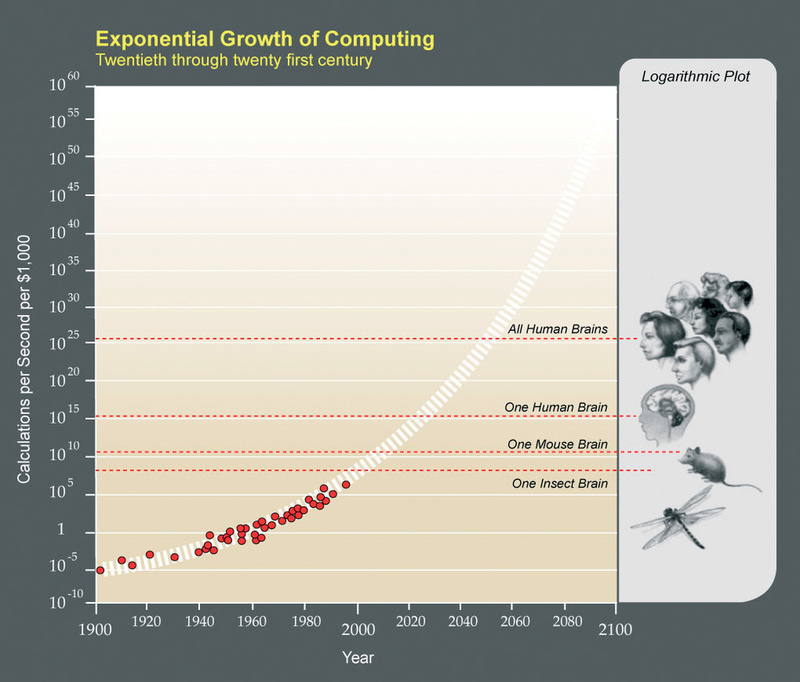 Ray Kurzweil believes that the exponential growth in computing power will result in computers matching the human brain by 2020!The careful among us used to move existing hard drives already containing sample libraries to the new PC, saving days of effort, but such options are beginning to disappear as well. Last year, sadly, saw the demise of the ground‑breaking Gigastudio software sampler, partly because many sample‑library developers were so sick of the rampant piracy of unprotected Giga‑format libraries. Nowadays it's far more likely that major library releases will come with an associated sample‑playback engine featuring challenge/response protection tied to one computer. 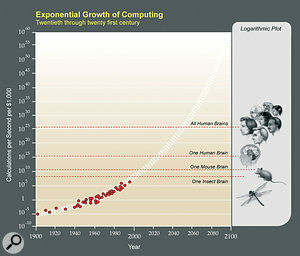 Another area in which musicians declined to move 'forward' in 2008 was with operating systems. Windows Vista celebrated its first birthday in 2008, but remained a resounding flop with the majority of musicians, who were perfectly happy with the Windows XP that they already had. This situation wasn't helped when I discussed the DPC Latency Survey results in SOS June 2008, which showed that quite a few musicians who had bitten the bullet with Windows Vista were suffering audio clicks and pops that completely disappeared when they reinstalled Windows XP on the same machine. Not much encouragement there! As I discussed in August 2008, one area in which quite a few PC musicians truly wanted to move forward was by installing more than 4GB of system RAM so they could load in more sample data, but were thwarted in their attempts by the limitations of Windows 32‑bit operating systems. This is the point where moving over to Windows Vista 64‑bit is the most sensible decision, as long as you're prepared to negotiate the minefield of 64‑bit 'compatible' software (which runs under a 64‑bit operating system but provides no performance benefits) and true 64‑bit software that can take advantage of more than 4GB of installed RAM. Fancy using your existing MIDI controller to control media players, Powerpoint presentations, edit your videos, and be in charge of your live setup? 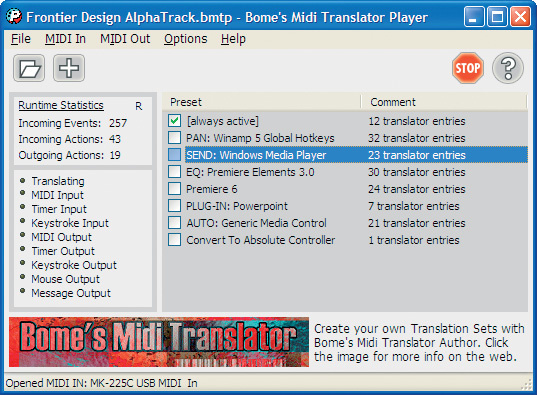 Enter Bome Software's MIDI Translator. Ironically, the increasing number of PC musicians happy with their current computers resulted in a pleasing side‑effect in 2008: I was very pleased to notice that the SOS PC Music forum, while still attracting the usual batch of 'which soundcard?' and 'is this PC component list OK?' queries, also displayed a significant increase in questions relating to actually making music. So if greater numbers of us are happy with our existing PCs for the foreseeable future, can we rest on our laurels? Not a bit of it! Nowadays, the life of the PC Musician not only involves composition, recording, mixing, and in many cases mastering, but may also include many other aspects of music production, such as the creation of CD/DVD artwork, MP3 files and videos, plus the selling of our own music through commercial and private web sites. Having finally managed to launch my own web site in 2008, I have great admiration for all those who 'go the whole hog', getting CDs manufactured to sell at gigs, through existing record labels, and via their own web sites. I lost count of the excellent sites I visited during 2008 that had been created by SOS readers and forum users, and now know only too well how much effort is required. Even if you've jumped off the PC upgrade bandwagon, there are still plenty of other, more creative activities to keep you fully occupied! MIDI Controllers are now widely available and fairly cheap, so it's not surprising that some musicians have wondered about using them to control devices other than hardware synths and software sequencers. 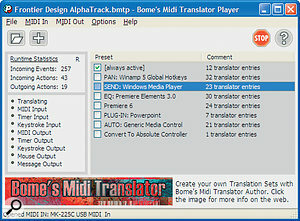 Enter Bome Software's MIDI Translator utility (www.bome.com), which essentially turns incoming MIDI messages into other outgoing MIDI messages, computer keystrokes, mouse actions, or even computer window actions. It's currently PC‑only, although a Mac OS X Beta version is also available with more limited functions. On the PC it's available in four versions. The original Classic has limited features but is free for personal use and costs just 29 Euros for professionals. Essentially, it converts incoming MIDI messages into different outgoing MIDI messages or one or more computer keystrokes. The Pro version (59 Euros) in addition lets you use incoming keystrokes and timer messages. You could, for instance, generate a gradual ramp up or down over a specified period from a single keypress, so you could fade a live track in or out by pressing and then releasing a specific note on your MIDI keyboard. It can also generate mouse clicks and movements and computer window messages, as well as offering various rules for conditional execution. The Player version is free, provides the full feature set, and is bundled with plenty of pre‑written presets that interface between various popular controllers, hardware synths and software applications. However, you can't create or edit your own presets, which must instead be written using the Author version (119 Euros), which can also create encrypted presets for others to use with the Player. Enough tech talk: a few examples will demonstrate just how versatile the MIDI Translator can be. It's been used with a host of different MIDI controllers, from simple footpedals to more sophisticated ones like Mackie's Control Universal Pro and freeform devices like Jazz Mutant's Lemur. Users have configured it to enable their MIDI controllers to trigger and edit videos, control Powerpoint presentations, and to be usable instead of expensive dedicated controllers sold for games and flight-simulator software. For many musicians, MIDI Translator's most attractive use will be creating complex live performance setups. To see a classic example of this approach in action, take a look at the YouTube video of artist Kid Beyond using Ableton Live and MIDI Translator Pro (http://uk.youtube.com/watch?v=HfBh3lZZi8Q). Each of his footswitches sends sequences of multiple keystrokes to Ableton Live, so after initially setting up his laptop, he can perform live on stage creating entire songs from multiple loops without ever touching a mouse or looking at the screen display. Creating your own presets isn't a trivial exercise, and you'll need to know a bit about MIDI messages in their hexadecimal format, and to understand some single logic, but Bome Software have active forums on their web site, where head developer Florian Bömers offers suggestions and solutions. Overall, if you're a live performer or want to put an existing MIDI controller in charge of other software or hardware, MIDI Translator is a dream come true. Ironically, when most of us upgrade our PCs they are working perfectly, but are just getting too slow or clogged up with 'stuff'. However, if more of us are going to be using our existing PCs for longer we'll have to get used to occasionally replacing components that wear out. With hard drive prices as they are, if you hear strange noises from your existing drive or have difficulties reading any file, the safest thing is to quickly buy a replacement, and transfer the data across from the old drive to the new one before it gets any worse (I described his process in detail back in SOS February 2005, which you can find on-line at /sos/feb05/articles/pcmusician.htm). If you suspect RAM problems, run a utility such as Memtest86 (a free download from www.memtest86.com) to check it, and replace any sticks that prove faulty. The most common problem with older PCs is motherboard batteries eventually wearing out. Over Christmas, I unplugged my five‑year‑old office PC from the mains for a week, and when I next booted it up I received an error message to the effect that several motherboard devices hadn't been found — a classic symptom of the motherboard battery wearing out and 'forgetting' my BIOS tweaks. To replace the battery, first switch off your PC, and then remove the existing battery. Although a few use rechargeable NiCad cells that may need unsoldering, most use common button cells as used in watches, which can be carefully slid out or released via a locking clip. Replace with an identical new cell in the same orientation (normally '+' side upwards), and then switch on and enter the BIOS to restore the current time and data information, as well as any BIOS tweaks you previously made (you did note them down, didn't you?). If you ignore previous BIOS tweaks and attempt to boot into Windows with formerly disabled devices now enabled, this may be sufficient to convince Windows you're attempting to run it on a different PC, and it will demand to be reactivated. If this happens, you can normally call a Microsoft Freephone number and get a new activation code within a couple of minutes.